News - McCartney set for Nirvana reunion? 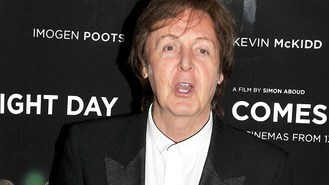 McCartney set for Nirvana reunion? The former Beatle will replace the band's late frontman Kurt Cobain when they perform at a gig in aid of victims of Hurricane Sandy in New York tonight (December 12), reported The Sun. Macca has apparently been working with Nirvana - drummer Dave Grohl and bassist Krist Novoselic - since a recent studio session and will now join them on stage at the 12.12.12 concert, which will see them reunite for the first time in 20 years. The star confessed he didn't know too much about the grunge band before they started jamming together. "And somebody whispered to me 'That's Nirvana. You're Kurt.' I couldn't believe it." Cobain committed suicide in 1994 at the age of 27.